The #MAVEN spacecraft has successfully completed the first two of six maneuvers of the transition phase that will conclude when the spacecraft begins collecting science data on November 8th. The two burns have reduced the capture periapsis (closest point to Mars in the orbit) from 380 km to 204 km and the captured orbital period from 35 hours to 5.5 hours. The first Periapsis Lower Maneuver was a maneuver of 8 m/sec. performed at apoapsis (farthest point from Mars in the orbit) with the purpose of reducing periapsis. 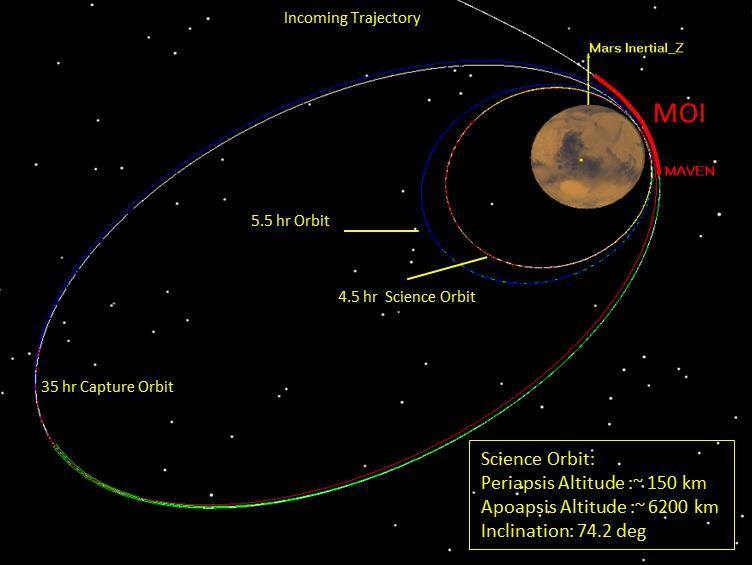 The first Period Reduction Maneuver was designed with a delta-V (∆V) of 455 m/sec., about 37% as large as the #Mars Orbit Insertion maneuver, and reduced the orbital period most of way to the science requirement of 4.5 hours. A follow up PRM-2 using only the Trajectory Correction Maneuver engines is scheduled to be performed Oct 2nd to reduce the orbit period the remaining 1 hour.